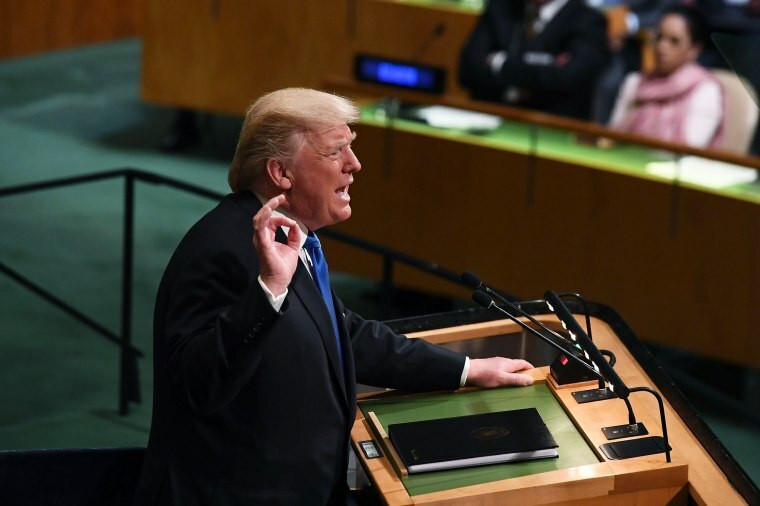 UNITED NATIONS — President Donald Trump, in his first address to the United Nations, derided Kim Jong Un, North Korea’s leader, as a “rocket man” on Tuesday as the president warned that he may be forced to "totally destroy" the rogue nation. "If the righteous many do not confront the wicked few, then evil will triumph," Trump said, as he detailed the horrors of what he called the "depraved" North Korean regime. "Rocket man is on a suicide mission," he said, using a nickname for Kim that refers to the North Korean leader's recent missile tests. The North Korean ambassador to the U.N. walked out before Trump's speech started. Trump’s remarks to the world body come amid sharply escalating tensions between the U.S. and North Korea. Both the president and Defense Secretary James Mattis have said all options are on the table for dealing with the threat from North Korea. While the U.S. could take military action, Trump urged the U.N. to join together in curtailing North Korea's nuclear efforts. "We meet at a time of both immense promise and great peril," Trump said, issuing a call to action that hinged on the responsibility of governments to their citizens. "As president of the United States, I will always put America first," he said in a phrase reminiscent of one of his key presidential campaign slogans. And Trump urged other leaders to do likewise and always "put your countries first." The president also took on Iran, dismissing the nuclear deal between Tehran and the U.S. and other world powers that lifted sanctions in exchange for Iran curbing its nuclear program. Trump ripped the deal as an "embarrassment" and vowed that this would not be the last the world hears about it — "believe me." Iran's future, Trump said, comes down to a choice between continuing on its current road or returning to the nation's "roots as a center of civilization, culture and wealth." The speech was a nationalist appeal — which had helped fuel Trump's rise to the presidency in 2016 and that his administration has grappled with in its policy making, both foreign and domestic. Trump said that under his watch the U.S. is a nation that the world would no longer take advantage of, be it diplomatically or on matters of trade. While the president said he seeks strong trade ties around the world, that trade "must be fair and it must be reciprocal." While Trump promised to uphold America's interests above all, "we also realize it's in everyone's interest to seek a future where nations can be sovereign, prosperous, and secure." Those complaints about lack of fairness and reciprocity are not new. Trump left the Paris Climate Accord because he lamented it was unfair to U.S. workers. He's railed against multilateral trade deals, like NAFTA and the Trans Pacific Partnership, that he feels don't benefit the U.S.
"Are we still patriots?" Trump asked in his address. "Do we love our nations enough to protect their sovereignty and to take ownership of their future?" Though his morning remarks focused on strength, a toast Tuesday afternoon was made in the name of "potential." "The potential of the U.N. is unlimited," he said. Acknowledging that he's been a "critic" of the organization in the past, Trump praised its future, saying "there can be no better forum" for world deliberations while raising a glass of red wine to the group gathered with him for the lunch. The president, who doesn't drink, raised the glass to his lips, though it was unclear whether or not he took a sip before passing it off to a waiter. On Wednesday morning, Trump circled back to the North Korea issue by criticizing his opponent in the 2016 election in series of tweets. "After allowing North Korea to research and build Nukes while Secretary of State (Bill C also), Crooked Hillary now criticizes," Trump tweeted. After allowing North Korea to research and build Nukes while Secretary of State (Bill C also), Crooked Hillary now criticizes. It is the height of hypocrisy. Obama and Clinton in effect gave nuclear weapons to North Korea by their policy of appeasement. Moments later he retweeted a post that had been written in response to his initial tweet that called it "the height of hypocrisy" that "Obama and Clinton in effect gave nuclear weapons to North Korea by their policy of appeasement." The tweets may have been in reference to Clinton's criticism of Trump during an appearance Tuesday night on "The Late Show With Stephen Colbert" on CBS, in which she called the president's speech at the United Nations "very dark, dangerous" and "not the kind of message that the leader of the greatest nation in the world should be delivering."